Wounded in a drug buy gone wrong, June March, a fledgling private detective, is forced to go home to her parents’ farm to recover. Her close-knit family is rocked when her ne’er-do-well brother-in-law, Roger, is murdered, after his part in a bank robbery. 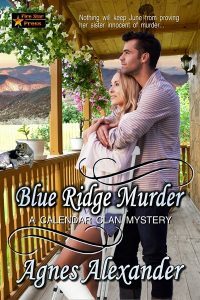 In the small community of Edison, North Carolina, nestled in the foothills of the Blue Ridge Mountains, secrets are hard to keep—even one as dangerous as murder. When June’s sister, April, is accused of killing her husband, June will do whatever she must to prove her sister’s innocence. County Sheriff Jason Striker, an old school mate of June’s, is dead serious about bringing the murderer to justice. But how can he find the killer and keep June safe when she insists on being part of the investigation? Nothing has changed since high school—June is still as determined as ever, and she still has a firm hold on Jason’s heart.